Last Thursday I on this blog I showed off my optional rules for critical failures. Along with that post came a critical miss effects table, currently available on the Free Game Resources section of this site. A few people said I should do a critical hits effects table for my next post and who am I to deny the people what they want? 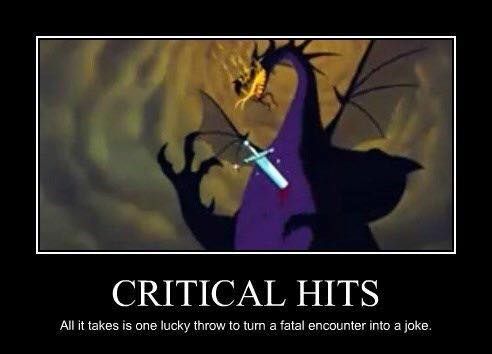 I should say this – critical hit effects are not for everyone. There’s already something pretty cool in the rules as written that happens when a natural 20 is rolled on an attack. It’s fast and easy to use. Rolling on a table for every critical hit takes a little more time. These rules aren’t for every group, but if you want to make critical hits more powerful or more randomized in their effectiveness, then give the rules below a shot. If you want a brutal critical hit effects table with devastating, lasting effects, consider using the rules for lingering injuries on pages 272 and 273 of the Dungeon Master’s Guide. If you want an expanded list of injuries and less chance of losing an eye, check out the expanded lingering injuries table I created. Of course, not every table needs the effects of their critical hits to be so lingering. The results on the table are a little more fast-acting and it also means that the DM and players don’t have to track injuries. You can use the critical hit effects table in two ways. You can roll on the table below in addition to the normal effects of a critical hit or you can roll on the table below and use the effect you roll instead of the normal effects of the critical hit. If you are doing the former, consider only having players and legendary creatures roll for critical hit effects to speed up play and to not have a single lucky attack from a random goblin mean the end of a PC (though some DMs might like that random chance). 1 – 4 The target is pushed back 5 feet. 5 – 8 The target is pushed back 10 feet. 9 – 11 The target is pushed back 15 feet. 12 – 15 The target falls prone. 16 – 19 The target is pushed back 5 feet and falls prone. 20 – 22 The target is pushed back 10 feet and falls prone. 23 – 25 The target is pushed back 15 feet and falls prone. 26 – 28 The target drops whatever it is holding. 29 – 31 The target’s drops whatever it is holding and any nonmagical objects it drops break. 32 – 34 A random item carried by the target (determined by the DM) drops out of the target’s belt pouch, backpack, or other carrying equipment. 34 – 35 A random nonmagical item carried by the target (determined by the DM) drops out of the target’s belt pouch, backpack, or other carrying equipment and breaks. 36 – 37 The target’s armor or natural armor is damaged and it takes a -1 penalty to AC. This penalty lasts until the target’s armor is repaired (for worn armor) or it is magically healed (for natural armor). 38 – 40 Your staggering blow causes the target to be blinded until the end of your next turn. 41 – 44 Your staggering blow causes the target to be deafened until the end of your next turn. 45 – 47 You hit the target so hard it is frightened of you until the end of your next turn. 48 – 50 Your staggering blow causes the target to be incapacitated until the end of your next turn. 51 – 53 Your staggering blow makes the target nauseous and it is poisoned until the end of your next turn. 54 – 55 Your staggering blow causes the target to be stunned until the end of your next turn. 56 – 59 Your inspiring attack allows you grant an ally who can see you an attack against the target as a reaction. 60 – 62 Your inspiring attack allows you grant an ally who can see you and the target an attack against the target as a reaction. 63 – 65 Your inspiring attack allows any allies within reach of the target to make a melee attack against the target as a reaction. 66 – 69 The target has disadvantage on saving throws until the end of your next turn. 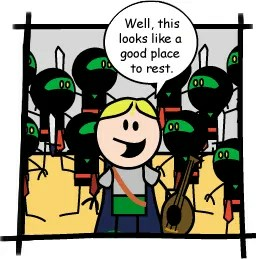 70 – 73 The target has disadvantage on attack rolls until the end of your next turn. 74 – 77 Roll all of the attack’s damage dice three times and add them together. 78 – 80 Use the maximum damage amount of all dice instead of rolling for this attack’s damage. 81 – 84 The target cannot make opportunity attacks until the end of its next turn. 85 – 87 The target take an action on its next turn. 88 – 91 You can make a follow-up attack against the target as a bonus action. 92 – 93 If your attack was made with a spell or magic weapon, a shockwave is released from your attack. Creatures within 10 feet of the target (including the target and you) must succeed a DC 15 Strength saving or fall prone. 94 – 95 If your attack was made with a spell or magic weapon, a shock wave is released from your attack. Creatures within 10 feet of the target (including the target and you) must succeed a DC 15 Strength saving or fall prone. 96 – 97 If your attack was made with a spell or magic weapon, some of the magic goes awry in your favor. The target is charmed by you until the end of your next turn. 98 – 99 If your attack was made with a spell or magic weapon, some of the magic goes awry in your favor. The magic holds the target in place and it is restrained until the end of your next turn. 100 If your attack was made with a spell or magic weapon, some of the magic goes awry in your favor. You become invisible until the end of your next turn. This effect ends early if you make an attack or cast a spell. Just like with the critical failures, these rules for critical hits are available as a PDF. Use the link below to grab it now.